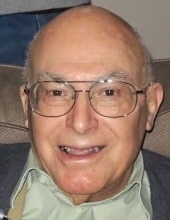 Baird, William "Harry"- age 90, of Flint Township, died Thursday, April 11, 2019. Funeral services will be held 11 AM Tuesday, April 16, 2019 at Sharp Funeral Home & Cremation Center, 6063 Fenton Road, Flint, Mrs. Jennifer Felts, granddaughter, officiating. Visitation will be 4-8 PM Monday, April 15. Those desiring may make contributions to Genesee County Humane Society or Fisher House Foundation. Harry was born on December 18, 1928 in Flint the son of Deloss and Inez (Shieks) Baird. He was a veteran of the United States Army serving in Korea. He was married to Billie Manus and she preceded him in death in 1982. He worked as a TV repairman. He enjoyed his grandchildren and great-grandchildren and was an avid animal lover. Surviving are three children; Charlene (Madden) and husband Jerry Gatzemeyer of Bradenton, FL, Tim and wife Laura (Moore) Madden of Franklin, TN, Beth (Baird) and husband Jim Graham of Grand Blanc; grandchildren, Shawn and wife Kara Gatzemeyer, Chad Gatzemeyer, Eric Madden, Christopher Madden, and Jennifer and husband Bob Felts; great-grandchildren, Jackson, Mackinzie, Tyler, Jacob, Kendall, Bennett and Fletcher; sister, Sally (Chuck) Downing; several nieces and nephews. He was preceded in death by his wife, parents, siblings; Jim, Genevieve; and grandsons, Bryan Madden and Michael Graham. Tributes may be shared at www.sharpfuneralhomes.com. To send flowers or a remembrance gift to the family of William "Harry" Baird, please visit our Tribute Store. "Email Address" would like to share the life celebration of William "Harry" Baird. Click on the "link" to go to share a favorite memory or leave a condolence message for the family.